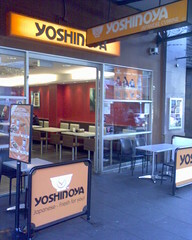 Having been in Japan for a year it was interesting to find a Yoshinoya in Sydney, on Oxford street. Apparently it has been there for a years, and I never noticed. Inside it didn’t quite feel like a Japan Yoshinoya, too much space. Though the menu looked about right (from the pictures, names didn’t necessarily match). Something to try in the future, but didn’t have time on the day. Walking down Oxford street the other day I noticed Yashinoya was missing. It appears that it closed in September 2009, found this tweet and photo. 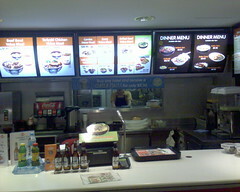 This entry was posted in Photos and tagged food, Japan, restaurant, Sydney, Yoshinoya. Bookmark the permalink.